Lady Deirdre Dyson was commissioned to create fourteen contemporary carpets – six hand knotted, free-standing rugs and eight gun tufted, fitted carpets together with a stair runner over four floors for this 18th Century listed Georgian townhouse. The house, actually two adjoining properties, was restored and repurposed by Alexander Martin Architects (AMA) for use as private offices in Mayfair, London. 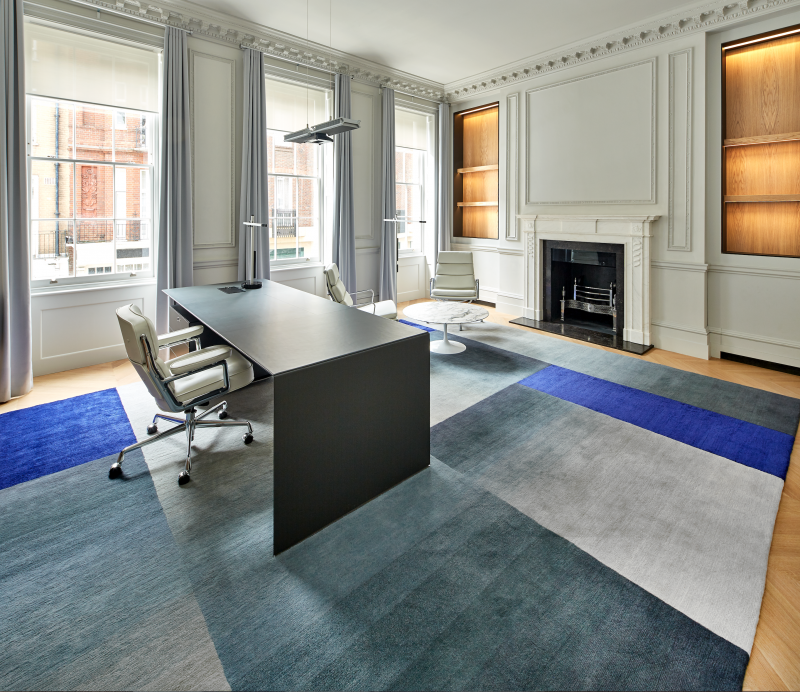 The brief required Deirdre to design a total of 350 square metres of highest quality wool and silk floor coverings for the entire property. 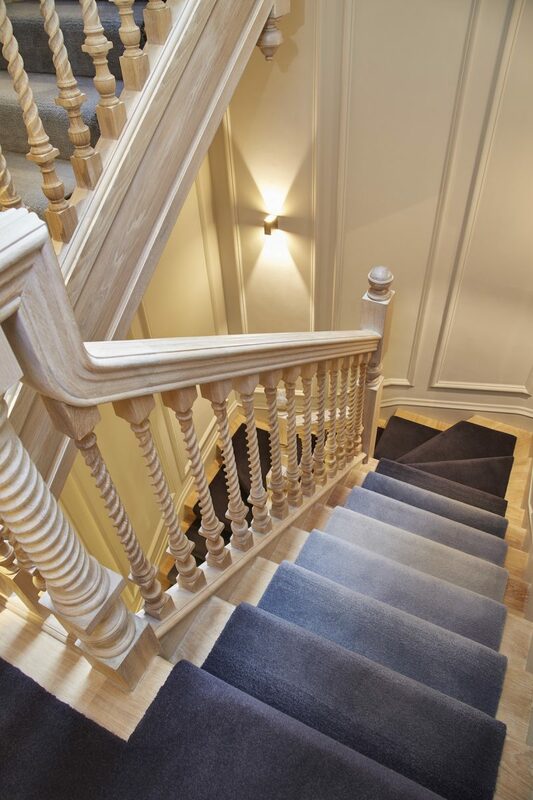 The incredible gun tufted 100% wool graded carpet created for the oak barley twist staircase. Materials throughout the building were selected for their timeless quality, echoing those present in the original building. 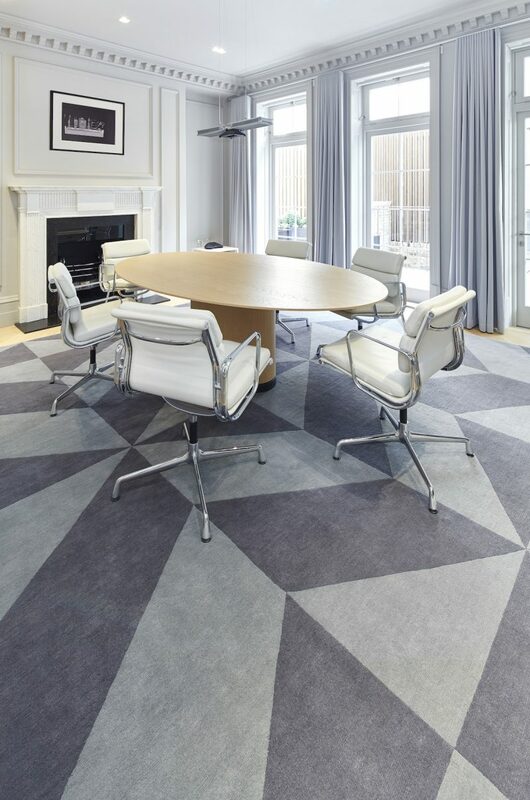 A palette of natural oak, stone and pale grey provides a backdrop for the bespoke Deirdre Dyson carpets used throughout. 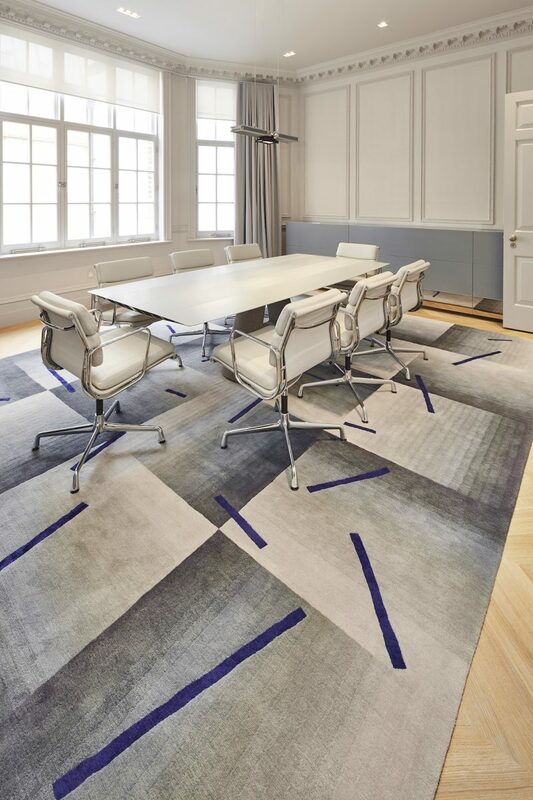 The expanses of wool and silk used in the rug, carpet and runner designs sit perfectly with remaining original features and the stark modern interior application in the office spaces on the upper floors. A bespoke gun tufted, fitted version of TWILIGHT in one of the top floor office spaces. Through her use of bold geometric designs, Lady Dyson developed a scheme to bring contrast and complimentary accent colours which define and enhance the individual rooms. A total of fifty separate colours were used across the project with some carpets having up to sixteen colours alone. 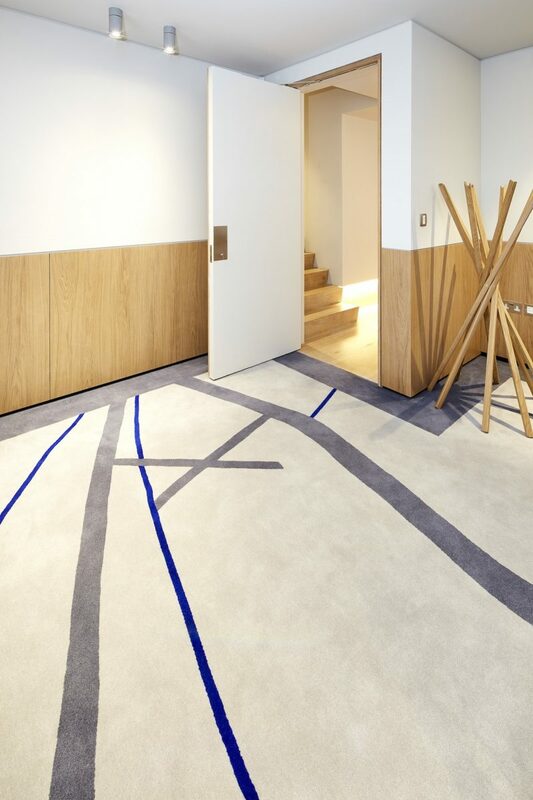 The carpets give each room a separate identity and interest but Dyson has connected the spaces using a similar colour palette, often through the use of colour grading, adding personality with dramatic bursts of colour, be it a bold blue or vivid terracotta. All working in tandem with remaining original features and the architect’s contemporary reworking of the building. 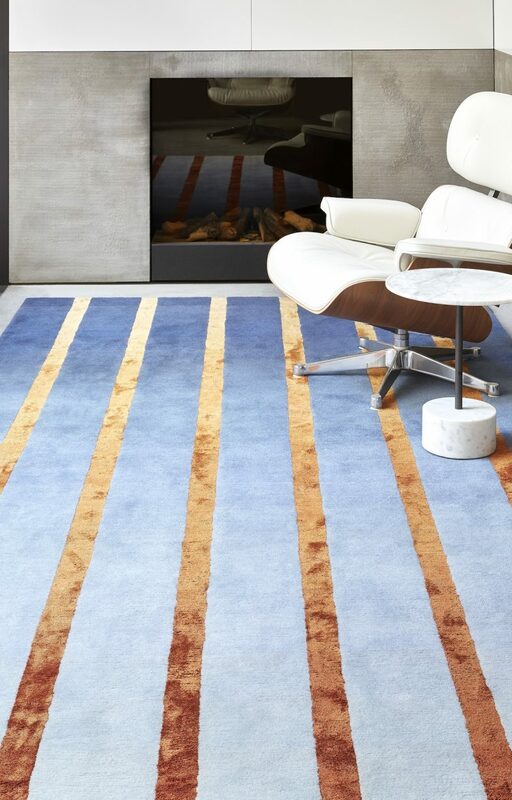 In some cases, Deirdre’s designs reference the building directly such as a version of her DAWN carpet design, its dramatic copper silk stripes echoing the copper cladding in the garden outside. Deirdre Dyson’s bespoke hand knotted DAWN carpet in the Garden Room. The scale of these carpets created challenges for both our weavers in Nepal (in some cases measuring up to 5m square) and the skilled tufters here in the UK as well as specialist fitters but a close, collaborative team effort realised Deirdre Dyson’s vision to stunning effect. The project featured in an extensive editorial feature in Wallpaper* magazine, click here to read.